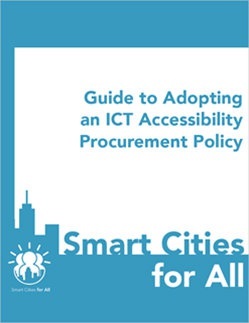 This short, concise guide was written as part of the Smart Cities for All project, but the content applies very broadly for any group that is interested in implementing ICT accessibility in any public procurement policy project. The introduction/summary briefly describes the history behind the creation of the technical standards that should be referenced in procurement policies. (The technical standards describe how ICT should operate to be considered accessible to people with disabilities.) These standards and rules—covered elsewhere in the portal—provide the technical foundations on which to base more inclusive policy practices. The guide provides a high level introduction to the Model Policy, as well as step-by-step checkpoints on how to adopt ICT accessibility in your procurement policy.